ENTER TO WIN ON SEPT. 28th! No purchase necessary to enter. 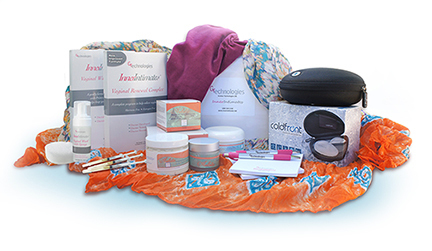 Just click the “Enter To Win” button below to Share Your Menopause Experience in 100 words or less and automatically be entered into the Share Your Secret Sweepstakes for a chance to win our amazing Women Helping Women Gift Box valued at over $400. Products to improve the appearance and healthiness of your skin. Click here to learn more about Asebella Skin Care. Give Menopause the Cold Shoulder with your own Personal Cooling System. Click here to learn more about Coldfront. Fashionable Wicking Sleepwear for Relief from Night Sweats and Hot Flashes. Click here to learn more about DryBabe. A colorfully patterned Spirited Woman Prayer Scarf. Click here to learn more about Spirited Woman. A Complete Program to Help Restore Vaginal Health including Vaginal Renewal Complex and Wash. Click here to learn more about Inner Intimates. No purchase necessary to enter. By participating in this promotion you agree to the official rules. Winner will be drawn at random on Sat. Sept. 28, 2013. This promotion is sponsored by Olga’s Secret | Inner Intimates 177 Continental Avenue | E. Northport NY 11731.